in Collaborations· Competitions & Giveaways! Sleep is something that I really struggle with, or more so the lack of sleep! I survive on 3-4 hours sleep a night, less on a bad night, and as a result I am perpetually tired! Infact, I don’t remember the last time I woke having had a good nights sleep, and with four children to run around after, it’s really not ideal. Recent research from Nytol, the UK’s favourite sleep aid brand, shows that 50% of adults aren’t getting enough sleep at night, and 1 in 4 say they would be happier if they had more sleep, so it seems I am not alone in this struggle. The sleep study reveals that nearly half of us admit that we have no bedtime routine at all, too pre-occupied with emails, texts and social media on our phones or electrical devices. It’s no wonder that 61% of people say they have no energy the next day after a bad nights sleep, 51% admit to feeling grumpy and 45% say they can’t concentrate. It goes to show that a lack of sleep really does have a huge impact on our physical and mental health. 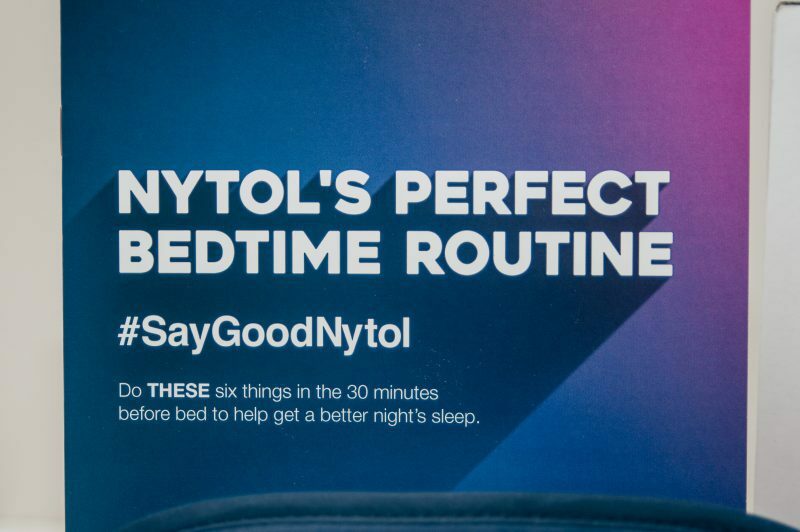 For that reason Nytol has teamed up with a leading sleep expert to create the countdown to a perfect nights sleep. 30 minutes – Prepare for sleep by completing any final tests for the day. Write down your worries and your to do list for tomorrow and that’s it. 25 minutes – Reduce your exposure to blue light which is known to suppress the release of melatonin. Put down your phone, laptop or tablet and avoid any light level above a normal lightbulb. 20 minutes – Brush your teeth and remove your make up well in advance of getting into bed. 15 minutes – Take a hot shower. Not only is this relaxing but it also helps us to cool down ready for a good nights sleep. 10 minutes – Conclude any activities you need to do before getting into bed, such as visiting the bathroom. 5 minutes – Bed means sleep and at the end of the 30 minutes it is time for bed. It might sound simple but give it a try for five days and it should make a huge difference! Plus one lucky winner can win a bundle of goodies to aid them in their quest for a good nights sleep! 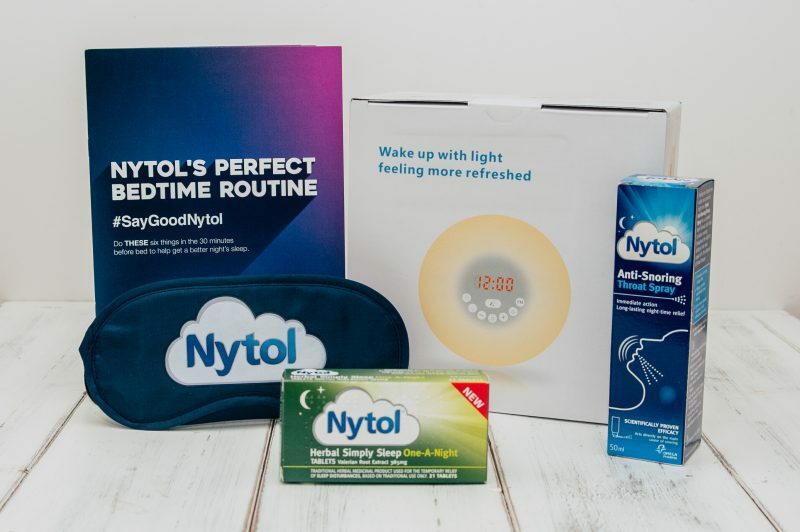 We are giving away a Lifebee Wake Up Light alarm clock, eye mask, Nytol ant-snoring throat spray and Nytol Herbal Simply Sleep One-a-Night. 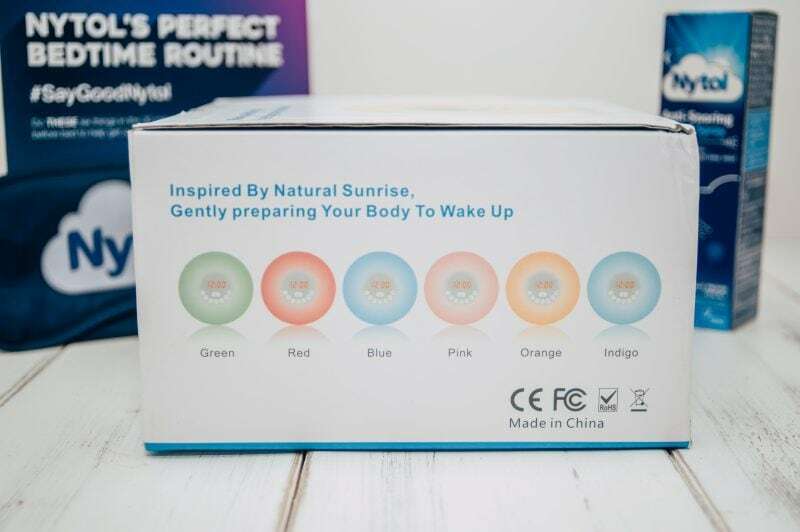 I love the Lifebee Wake up Light alarm clock which gently prepares your body to wake up, inspired by natural sunrise. It’s far better to wake up that way than with a harsh alarm sounding! To be in with a chance of winning this bundle, enter via the link below. One winner will be chosen at random and notified via email at close of competition on 29th April. Good Luck! Tends to take me some time to get over to sleep at night. A hot bath with lavender and then a warm drink. Fantastic prize! I tend to fall into bed exhausted, sleep 8 hours and wake up exhausted! I could sleep 15 hours a day no problem, which would be great if I actually felt any benefit from it! Routine bath read lights out – thats the theory! I am terrible at going to sleep, it takes me ages some night. I do try reading. By taking Nytol! If I don’t then I struggle to get off to sleep! 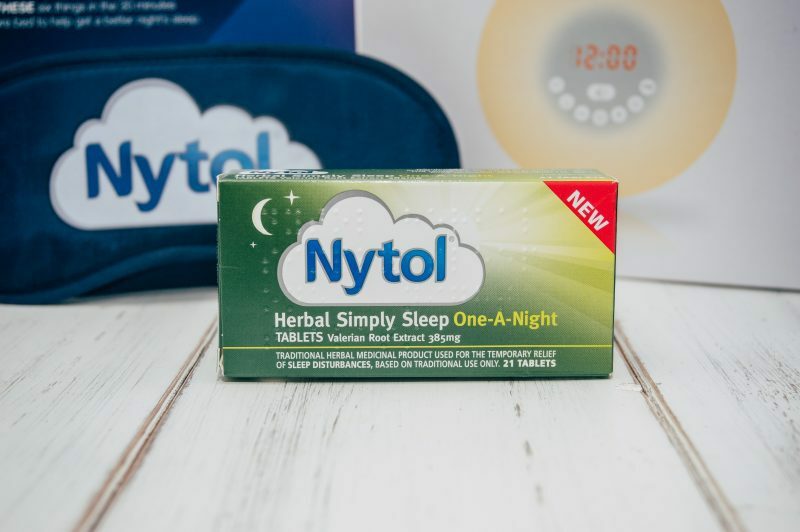 I don’t sleep very well and have been using Nytol 1 a night for 10 years but only once or twice a week to help me get a really good nights sleep…..thanks for another great competition! I try to sleep at least 7h, but at times of stress I don’t get more then 3-4h …. I don’t really have a routine, I just go to bed when I’m exhausted! By making my fiance sleep on the sofa! I’m very good at sleeping but sadly I don’t get enough time in my bed! Definitely best to avoid screens leading up to bedtime – adults too, not just kids – and not to dwell on the to do list. I’m a big fan of the American mystic Neville Goddard and his practise of revising (ie reimagining the events of the day as you would like them to have gone) before dropping off to sleep is a great way of dealing with any worries or irritations at the end of the day. I tend to have difficulties dropping off to sleep so sometimes I listen to music which usally works. I try to have a regular routine and have a wind down period of at least half an hour without screens before trying to sleep. I like to meditate for twenty minutes to help me relax and get a good nights sleep. I wait till i am exhausted then lie in bed till i drop off. With very great difficulty! I would love to try this out! Very difficultly, it us just as hard for me getting off to sleep as it is staying asleep, I’m lucky if I get 5 hours. I struggle, it is just as hard for me getting off to sleep as it is staying asleep, I’m lucky if I get 5 hours. My sleep routine starts with a warm bath, then a total body moisturise. Then a book in bed with a peppermint tea. And I use a sleep spray from Avon in my room and pillow, and put sleep balm (also Avon) on my pulse points. If I’m still struggling to drop off, I will take a Nytol. I try and wind down by turning off my phone and iPad an hour before bedtime. Also avoiding caffeine! I have great difficulty sleeping but I find a hot bath followed by a hot milky drink and a good read under cosy bed covers helps. Sadly I have insomnia and currently going through a really difficult patch in my marriage so my anxiety keeps me up literally all night. Bath to relax. . sometimes wine! I like to cosy up under the covers, if the room is stuffy I sprinkle some olbas about as i know it’ll help. Myself i normally read a book then after a chapter i stop reading the book and attempt to fall asleep. Switching everything off and closing the black out curtains. Otherwise I’m just thinking all night long. l really struggle to settle down so l tend to have a bath, read for about half an hour then try and just lay down relax and hopefully fall asleep. I use lavendar room spray! It’s quite hard as I work a shift pattern, so I do not get that much sleep, not consistent. I don’t have my trouble going off to sleep but I struggle to stay asleep. I normally wake at about 3 am and struggle to go back. I have tried everything but do find that breathing exercises help. I only manage between 4-5 hrs a night and feel shattered all the time. I don’t ususlly have a problem getting to sleep…it is STAYING asleep that I struggle with. I only sleep for about 4 hours maximum and then I am wide awake again. Bedroom really dark and I listen to classical music. I like to have a nice bath in Lush Twilight. I go to sleep with classical music. I dont usually get a full night sleep these days thats why i would love to win this wonderful prize. I do find that not going to bed on a full stomach helps though. I try and switch off. I like to soak in a lavender bubble bath before bed to help me sleep! I sleep pretty well on most nights. There is the odd night where I do however have a little trouble getting to sleep. I turn down the lights soon after dinner and switch them off completely about an hour before bed. Sometimes it helps. Pillow sprays are also helpful sometimes. I rarely do, here I am at 2.30am lol Fresh Bedding usually helps though. With difficulty, it takes me about 2 hours to get to sleep and I toss and turn a lot. I get to sleep instantly really but it’s the waking up all through the night I can’t cope with! Great giveaway. I use a sleep app to help me and when that doesn’t work, I use nytol! A hot both & a good book! I listen to Friends on an iPod. I read a book and have a small cup of chamomile tea before bed and drop off easily but then wake up constantly throughout the night. Most nights I have no sleep but when I do I feel amazing!nI usually have a relaxing bath then a big mug of hot chocolate before bed and I don’t watch tv in bed because I think that just keeps me awake longer. I just stay up until late then pass out kind of ? I go for a run before bed. Unfortunately with medication due to the fact pain keeps me awake every night. My fiance also struggles to sleep but no idea why so I would love to win for him.Thank you for the chance. Lights off, head hits pillow, gone…..
Bath, blackout curtains, and as much quiet as possible. I make sure I have everything organised for the morning and that helps with my anxiety. I also like to read a book and use a pillow spray. I spray lavender on my pillow to relax me naturally. Some nights I’m asleep as soon as my head hits the pillow, others I have to read for a bit or listen to an audio book to switch my mind off. I read, it helps me unwind. Not very well, so I could use some help!